Futo Estate was founded by Tom and Kyle Futo. Originally from Wichita, Kansas they have lived in Napa for a number of years. It is rare when a new 100% estate producer opens a physical winery within Oakville. If you are determined to acquire land in Oakville you must either purchase a winery or existing vineyards. There are very few “new” vineyards in Oakville and part of Futo’s Estate originally consisted of new vineyard plantings. 13 acres are planted to vine with the majority of the estate set on steep wooded hillside acreage in the western part of Oakville. Micro terroir always plays a part in this, the “tenderloin region of Cabernet Sauvignon”, to quote former Futo’s General Manager Joshua Lowell. 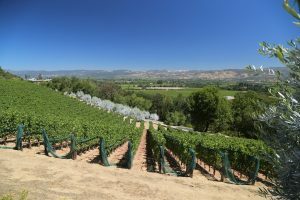 Aside from top vineyards located in this part of the valley, from an aesthetic point of view this “hidden” part of Oakville is one of Napa’s more picturesque locations. It is clear there is a well-focused passion and attention to making the best wines as possible from the estate. The focus is two-fold; building a wine estate for longevity yet simultaneously creating the best possible wines from each vintage. 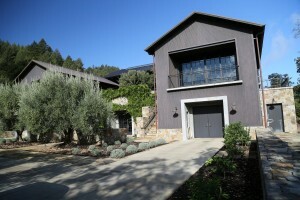 While this is a relatively new physical winery the estate is certainly not and already maintains a proven history. Part of Futo Estate is the former Oakford Vineyard property; well-regarded winemakers who made wine for Oakford in the past include Heidi Peterson Barrett and Marco DiGuilio. Other coveted producers in this vineyard neighborhood include Harlan Estate and Bond Winery. Futo Estate produces several limited production wines including an estate Oakville Cabernet Sauvignon blend and the FUTO 5500 Stags Leap District Estate Cabernet Sauvignon. OV was a second wine for a number of years – all sourced from their Oakville Estate however in 2012 this became the OV | SL wine with the addition of fruit from their Stags Leap Vineyard. Futo produces terroir expressive wines representative of their unique location. Their wines are rich, expressive and fairly approachable upon release. With excellent structure and acidity they are also built to age. From a vineyard standpoint this is a unique part of the Napa Valley in that it is tucked away from the main valley floor and the soils are a combination of both benchland as well as true hillside slopes (Mayacamas Mountains). The soils here are very rocky and well drained and the vineyards are separated into 5 different sites each of which contains a number of individual 1/2 acre blocks. David Abreu planted many of the vines on site; Clark Vineyard Management (a well respected vineyard management company based in the Napa Valley) helped Futo transition to their own vineyard management team. Their in-house vineyard management team makes the extra steps in terms of quality – hand selecting only the fruit they want to ripen, keeping the grapes from the vines at the end of the rows separate during the wine making process (not using this fruit in their own wines), and only using free run juice in their wines (no pressing). Their attention in the vineyard is all about the details: here is one example. A small patch of vines grows in a slight depression on the hillside in soils that are richer than the surrounding soils. The vines here are de-leafed immediately after the fruit is picked. If you see this particular block after harvest it certainly stands out – as the vines are leafless surrounded by the normal looking vines still full of green vegetation. Cabernet Sauvignon is the predominate varietal on the estate with Cabernet Franc, Merlot and Petit Verdot also growing. Great attention to detail has been put into the vineyard block locations and their exposures. When you examine Oakville closer you realize the diversity in micro climate and soils ranges dramatically from the eastern side of the appellation to the western side where Futo is located. This distance is approximately only 2 miles apart. The western side has less sun exposure then the eastern side and the vegetation differs between the two sides. Instead of the drier slopes and sparser vegetation found on the east, this western side is heavily forested. Their vineyards are at an elevation of between 300 to 500 feet; this is not benchland and not quite Mayacamas mountain vineyards either. While not receiving as much sun as the eastern hillsides of Oakville, Futo’s site tends to remain fairly warm during the growing season. The fog breaks sooner here and because of their slight elevation above the valley floor they tend to be exposed to the warmer air that rises due to an inversion layer. The winery itself was designed by renowned architect Howard Backen, the man responsible for designing nearby Harlan Estate, Poetry Inn on the other side of Oakville, Ovid Winery and Dana Estate near St. Helena as well as other prominent international buildings. Backen has worked on a number of select wineries but input also came from their winemaker at the time, Mark Aubert. The winery was designed with the property in mind. ; it is compact and very functional. With a number of small tanks Futo has the flexibility to ferment individual blocks on their own. The tanks are conveniently located right above the cellar rooms and the wine is fed via gravity down to this lower level. Their wines are always blends (Cabernet Sauvignon based). Their first vintage was in 2004, a mere 80 cases with their first commercial release coming in 2005. Their wines undergo extended maceration up to 30 days and sometimes longer. This is a process that actually helps to soften the hillside tannins. And their judicious use of oak is impressive – these are wines where the oak complements rather then dominates. They use a variety of vessels for aging including an approximately 70/30 regiment of new versus used French Oak – custom designed oak casks, and even a clay amphorae vessel. The 2005 Futo Estate is predominately Cabernet Sauvignon with the remainder of the blend Merlot. The bouquet shows concentrated ripe aromas of black fruit, black currant and blackberry with just a hint of espresso. The entry is surprisingly soft but quickly gains in complexity; it has great depth of flavor along with power. Sweet firm tannins begin to form just past the mid palate and lead to a long and satisfying finish. This wine has good structure and lively natural acidity – the key to the finish is that the tannins complement and are in balance with the layered fruit. The 2006 Futo Estate is even a darker wine than the 2005. It also has Merlot as well as some Cabernet Franc in the blend. It was just released prior to our tasting. This wine has an exotic nose with big bold dark fruit that shows an earthiness representative of this side of Oakville, minerals and even a hint of pencil lead. The mid palate is rich, well layered and opulent displaying a nice balance of black cherry, black licorice and dusty blackberry. This vintage has a larger backbone than the 05′ with wide broad shouldered expressive tannins. Like the 2005 this wine has an extended finish. Even during a challenging year in Napa such as 2011, Futo Estate delivers a beautiful wine. This vintage is dark, chewy, dense and complex. With good acidity, structure and fruit, this is a particular vintage from the property that should age extremely well. Futo is a label you will certainly recognize at first glance. It is creative and innovative and stands out without being flashy. An “F” for Futo is created in the empty space between the two pieces of the silver colored label. My Friends visited you yesterday! Nick Cambas and Mike Campagana. They are still raving!!!! Look forward to visiting you next trip to Napa!